This morning, like many mornings, I hit a major subway station at rush hour. 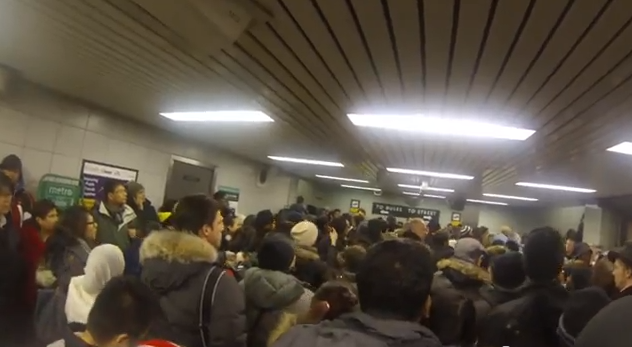 The station I go through (Yonge/Bloor) is so bad in the mornings, that for the past two years or so we have had to pay for people to direct the crowds until a proper crowd management plan is put into place. Whilst I appreciate that anything is being done to alleviate the madness in this station, I always shake my head and walk out of the station feeling like this temporary solution to a permanent problem is about as good as it'll get. You get the feeling that when a lot of the stations were first built, people weren't exactly factored into the design, so you end up with a situation that if it were fluid dynamics model would look something like a white-water river with it's eddy's and such. Given we now understand stations get crowded, I'd love to know how they're taking this into account in the new stations that are being built in more modern times. 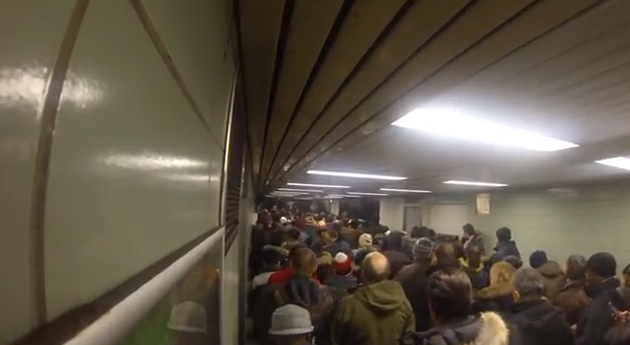 "An example of how we are trying to improve is the southbound Bloor platform experiment. 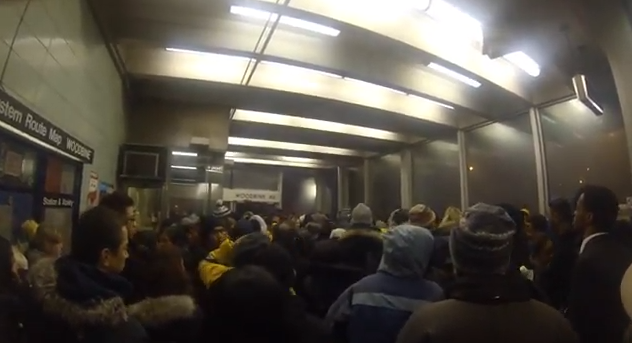 As some commuters may have noticed, during the morning rush hour, we have comprehensive crowd control measures at Bloor Station that have proven themselves very effective in decreasing the time a train stays in the platform and therefore allows more trains down the line and an increase in our peak capacity." That was in 2011. What they did here was have everyone ingress or egress via whatever stairs or escalators they like, and then we pay for men to stand at the top and bottoms of the stairs to act as overflow for the upward-bound escalators. In addition, a contraflow system exists on the upper-platform so that many people trying to exit the station are sent on a detour of a platform for a train they have no intention of riding. Remember, this is an improvement over what existed before. Now, I can complain about Bloor / Yonge Station, but whilst this is a small inconvenience, it's the smaller stations that are normally less busy that I spend more time thinking about because of crowd design. If you terminate two trains at once, you can not only fill both platforms, but fill the causeways that lead to the main concourse, as seen in this next image. Having gotten everyone packed into this area, it quickly becomes jammed, too. As shown here. 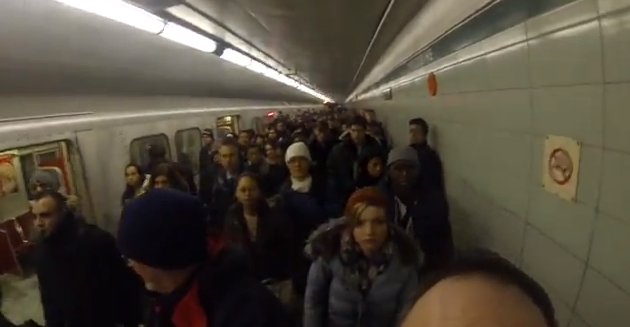 Passengers spooked at the rear, causing stampede towards front. Passengers restricted from exiting at front, causing a push towards the confused rear. Fire, Smoke or other substances in the air panicking people. Rumour of fire, smoke or other substances in the air panicking people, even if it doesn't exist. It's this "Black Swan" style of dangerous event that could happen at the smaller stations that bothers me more than the mundane capacity increasing crowd measures at the bigger stations. I'm just not convinced that there is a plan to have anything done about it. Further, if you're a passenger caught in a situation like this and you need to contact the emergency services, you have no chance of getting a signal to dial 911. That, to me, is a tragedy just waiting to happen.